Opportunities for people to interact with nature have declined over the past century, as most people now live in urban areas and spend much of their time indoors. And while adults are not only experiencing nature less, they are also less likely to take their children outdoors and shape their attitudes toward nature, creating a negative cycle. In 1978, ecologist Robert Pyle coined the phrase “extinction of experience” (EOE) to describe this alienation from nature, and argued that this process is one of the greatest causes of the biodiversity crisis. Four decades later, the question arises: How can we break the cycle and begin to reverse EOE? To search for evidence of these patterns across programs and the ability of citizen science to reach non-scientific audiences, the researchers studied the participants of citizen science programs. They reviewed 975 papers, analyzed results from studies that included participants’ motivations and/or outcomes in nature-oriented programs, and found that nature-based citizen science fosters cognitive and emotional aspects of experiences in nature, giving it the potential to reverse EOE. 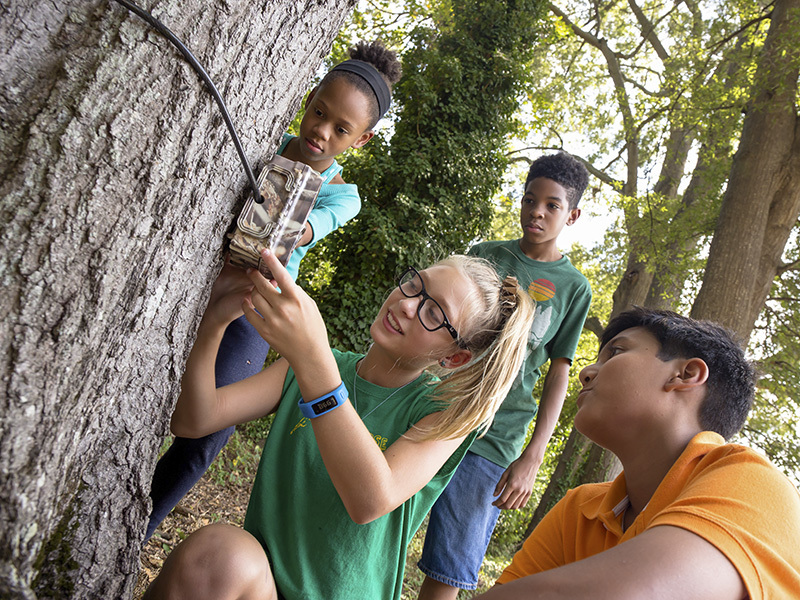 The eMammal citizen science programs offer children opportunities to use technology to observe nature in new ways. Photo: Matt Zeher. The N.C. Museum of Natural Sciences’ Stephanie Schuttler, lead author on the study and scientist on the eMammal citizen science camera trapping program, saw anecdotal evidence of this reversal through her work incorporating camera trap research into K-12 classrooms. “Teachers would tell me how excited and surprised students were about the wildlife in their school yards,” Schuttler says. “They had no idea their campus flourished with coyotes, foxes and deer.” The study Schuttler headed shows citizen science increased participants’ knowledge, skills, interest in and curiosity about nature, and even produced positive behavioral changes. For example, one study revealed that participants in the Garden Butterfly Watch program changed gardening practices to make their yards more hospitable to wildlife. Another study found that participants in the Coastal Observation and Seabird Survey Team program started cleaning up beaches during surveys, even though this was never suggested by the facilitators. Luckily, some other factors appear to influence participants’ involvement in citizen science. Desire for wellbeing, stewardship and community may provide a gateway for people to participate, an important first step in connecting people to nature. Though nature-based citizen science programs provide opportunities for people to interact with nature, further research on the mechanisms that drive this relationship is needed to strengthen our understanding of various outcomes of citizen science. Nature-based citizen science programs, like Dragonfly Pond Watch, offer participants opportunities to observe nature more closely. Credit: Lea Shell. This entry was posted in Citizen Science and tagged 2018 SIGGRAPH, alienation from nature, Amanda E Sorensen, Assaf Shwartz, beaches, biodiversity crisis, Bridging the nature gap: can citizen science reverse the extinction of experience?, Caren Cooper, Coastal Observation and Seabird Survey Team program, coyotes, deer, eMammal citizen science camera trapping program, eMammal citizen science programs, experiencing nature less, extinction of experience (EOE), foxes, Garden Butterfly Watch program, Israel, Matt Zeher, Nature, nature-based citizen science, North Carolina Museum of Natural Sciences, North Carolina State University, Rebecca C Jordan, Robert Pyle, Rutgers University, Stephanie G Schuttler, Stephanie Schuttler, Technion-Israel Institute of Technology, urban areas, US on August 10, 2018 by Maryse de la Giroday.